Senator McCain's voting record has in the past been better than in the current term, during which he has compiled a 48% rating with FreedomWorks. McCain famously said to "complete the danged fence" in reelection ads, but immediately softened his border security position once reelected. The Arizona Senator called Sen Ted Cruz (R-TX) "crazy" in an interview, after having undercut Cruz's plan for defunding Obamacare, repeatedly casting it as an attempt to shut down the government. 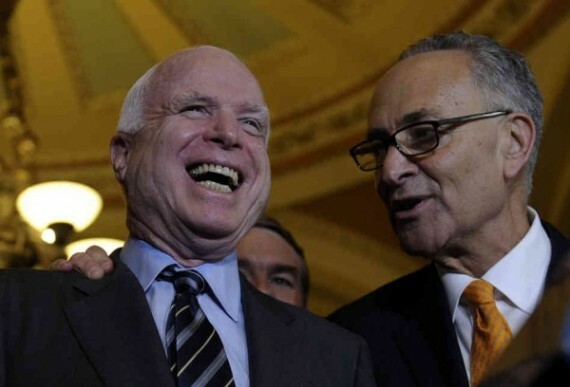 McCain stood with Senate Majority Leader Harry Reid against Cruz during the Texas Senator's overnight filibuster-like speech against Obamacare. Video of the debate and the vote itself can be seen at Redstate. The final paragraph is significant, as the Arizona conservatives have revitalized their party's ground game mechanism for getting out the vote. Again, this did not “just happen.” It happened because enough conservatives got inside the Arizona Republican Party by becoming elected precinct committeemen where they live in their own “political neighborhood” — their precinct. Then, they elected enough conservatives to become a voting majority of conservatives.